The first project of the semester for Intro to Visual Communication; this piece focuses on the limited colors and bold lines. The project was to create a logo based on a single word. The word I chose was ’emerge’, and what I created from it was a small sprout emerging from a box. Symbolically, its meaning is that to emerge from the pack, one has to think outside the box. However, simply drawing the logo into the center of the paper and calling it a day would not only be rather boring, but it wouldn’t be particularly artistic. So, I placed the logo, scaled down, on one of the intersections of thirds, and drew curly lines flourishing from the top of the sprout. Line weight is demonstrated here- not to denote depth, but to give them a sense of motion and make them more interesting to look at. Originally, I chose the arc window shape because I was going to create a ‘stained glass’ effect using a combination of watercolor and colored pencil; however I chose to scrap it in favor of the solo watercolor; adding pattern into the background would draw attention from the black lines, which are black in the first place to attract attention. If asked to choose whether this pieces was more evident of simplicity or emptiness, I would say that it’s simplicity. It’s a simple concept, thinking outside the box, and the logo itself is incredibly simply. I only used two materials, both of which are very straightforward. The window border is just a triangular pattern. The curly lines are the only detailed thing on the page, and even they can be considered simple. 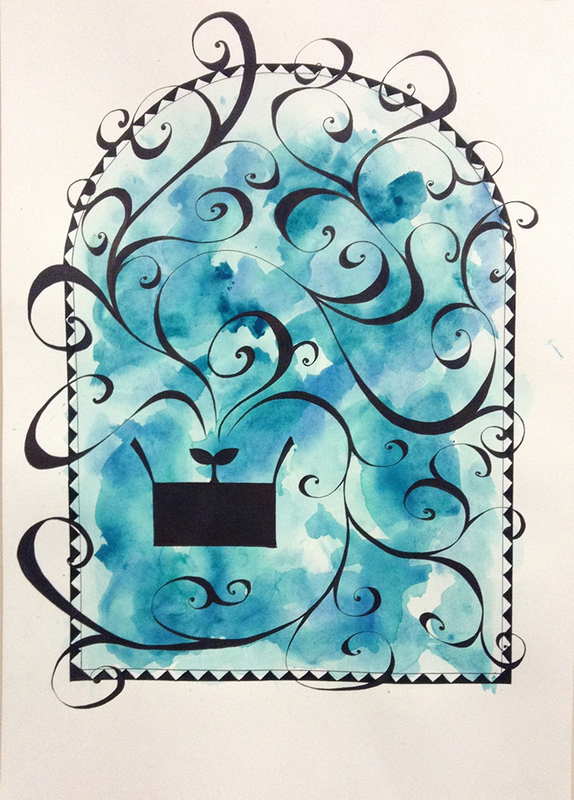 This entry was posted in Non Time-Based and tagged Ink, Intro to Visual Communication, Watercolor. Bookmark the permalink.